The long-running Homage series from Sonus faber pays tribute to the finest violin makers of the past with loudspeakers that look and sound fantastic. The Amati has long been the conventional top tower of the range, and with the wide-baffle Stradivari out of the latest range, the new Amati Homage Tradition represents the top of that range. It replaces the Amati Futura (tested in Hi-Fi+Issue 79); a chrome-topped floorstander with a unique damped suspension system. Both the chrome top and the squidgy baseplate are gone in the Amati Homage Tradition, and while that gives the latest Amati a more conventional look, it doesn’t hold back from looking fantastic in the flesh. 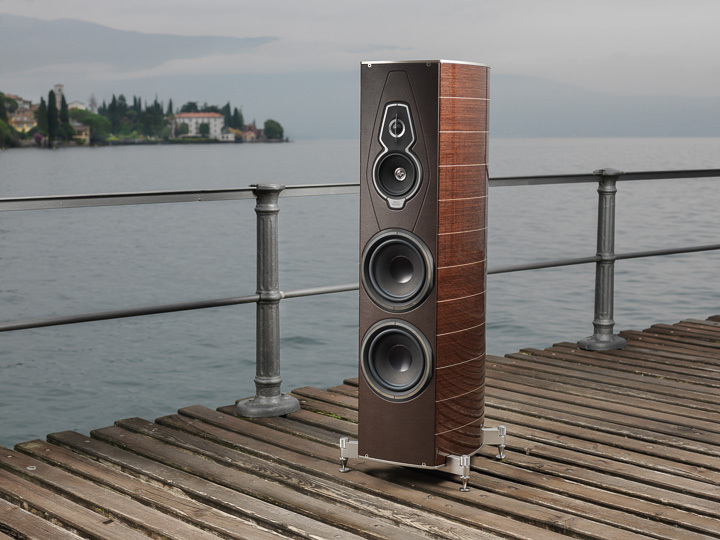 Sonus faber was always a hit in terms of looking good, but the new Homage Tradition range – in either a traditional red with chrome contrasts, or wenge with black – takes that to a clever combination of refined elegance and timeless chic that is reminiscent of Riva yachts. Unlike the Futura – which never quite shied away from a spot of ‘bling’ – this is almost understated luxury for the elegant home-owner. It remains a tall tower that needs to project into the room by about a metre, but it speaks to a home of taste and charm rather than shiny excess. The changes in each iteration of Amati seem larger than the last, and the Amati Homage Tradition holds to that ideal. Practically no parts from the Futura cross over to the tradition, and although both models are boat-tailed three-and-a-half way designs, culminating in a pair of 220mm bass drivers, exactly noneof those drivers are shared between the two models. OK, so there are probably some screws, spikes, terminals, and wires shared between the two, and looking at them side by side, you can see they are related, but this is a long way from a few cosmetic changes. But those cosmetic changes are pretty lovely. Alongside the Riva Yacht styling, as the name suggests, the Homage Tradition line have an instrumental look and feel to them. No, they are not directly channeling the father of the modern violin Andrea Amati (1505-77), but the range in the flesh looks less like audio components and more like the construction of master craftsmen.